PLEASE NOTE: This June shipment JUST arrived at the end of August. 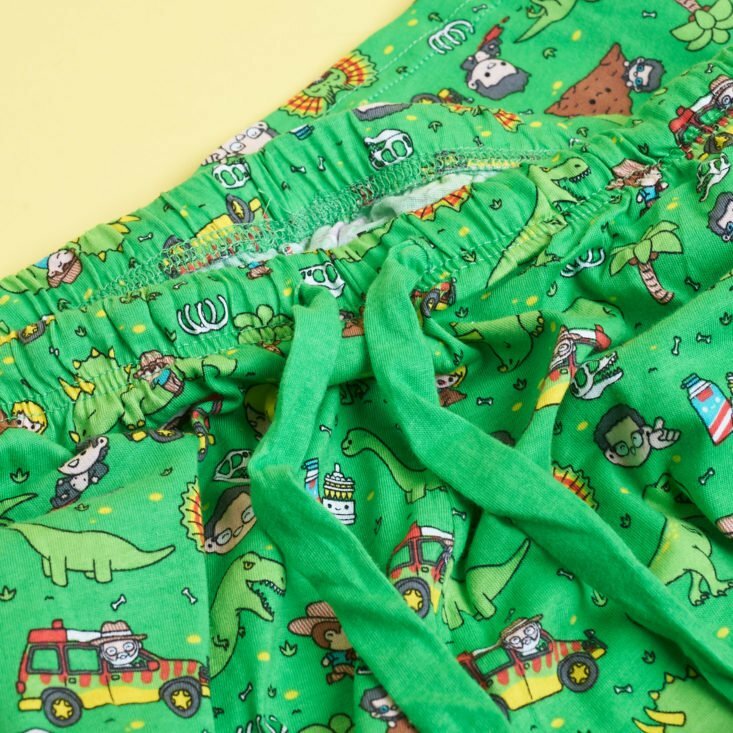 The June Loot Wearable item was a pair of lounge pants featuring Jurassic Park! It comes with a fold-out information pamphlet that will detail the entire Loot Wear line for that theme. Loot Crate pulled in the cute little 100% SOFT design into these lounge pants for the June delivery. They’re basic sleep/lounge pants – no pockets, pull-string waistline, and they are SUPER soft and comfortable. They’re actually pretty long – luckily, I don’t really mind that in lounge pants – this is probably my favorite Loot Wearable in quite a bit. Verdict: Of course, the shipping delay put a damper on my excitement, but overall these pants are really awesome and comfortable – I’m ready for that fall weather now! Can you still get this box if you sign up today? No. Themes cut off at the 19th of every month – so you can still get the September X-Files wearable. Check out all of my Loot Wear reviews to get more information on this subscription. Check out all of our Geeky Subscription Boxes in the Subscription Box List. Rate, review, and follow this subscription on the Loot Wearables profile page. What do you think of the June 2018 Loot Wearable? I absolutely love these! I love Jurassic Park and the print has such cute details! I also loved the loot for her items too.